With all the same features as the Lumistar C3x™, also compatible with the ThermalShield™ enclosure, but with latest state-of-the-art advancement in even higher resolution clarity and optics. Delivers 16-100 times the resolution of competitor cameras. One of the highest resolution thermal imagers available on the market exclusive to Lumistar Camera. Able to detect even small targets out in the distant horizon. 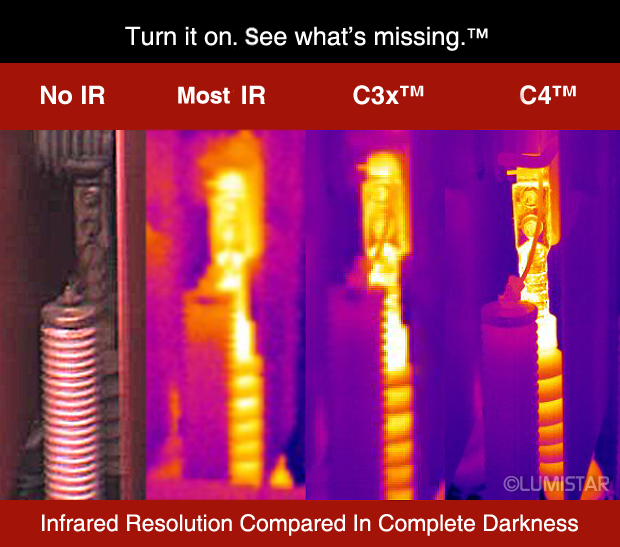 The Lumistar C4™ delivers the highest definition available in thermal illumination. Infrared cameras exceed the high definition surveillance capability of a CCTV security camera systems due to the ability to see in total pitch darkness -- zero light, and being able to see hidden persons or objects through vegetation or other camouflage due to their heat signature differential. Thermal infrared always gives away their true location. In an industrial location such as an auto shredder, the C4XL Elite™ version has built in SteamVision Technology™ making it second to none, and superior to any other camera on the market in seeing through a steam obstacle. Images can be viewed on a stand alone video monitor or connected to an existing CCTV video recording network. DVR options also available. Even more powerful high-resolution thermal imager allows you to see potential threats with the greatest accuracy. 3.5-second power on time, plug and play. Sharpening filter, on board digital software enhancement. Has an extensive and advanced set of built-in measurement functions allowing the camera to be used "stand-alone" without a PC. Use to improve your industrial operational efficiency. Enables you to monitor the areas most vital to your business. See exactly the same day or night in total darkness. Multiple color pallets to choose from: red hot, black and white, or spectrum. Ideal for individual or networked (multiple camera) installations. Small and sleek able to put in small areas. Operate under extreme shock, vibration, and temperature conditions. 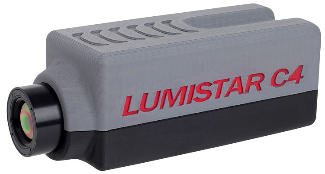 Lumistar cameras are precision engineered so you can increase confidence, productivity, and operational efficiency.